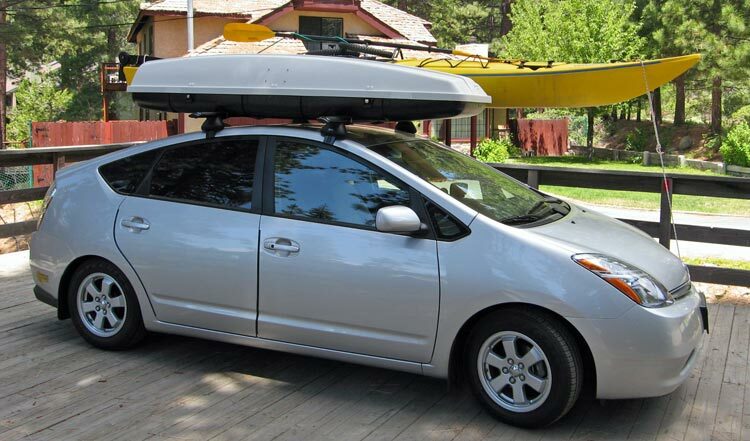 Since the Prius is our gas-guzzling, long distance PUV, it needs to carry some cargo. 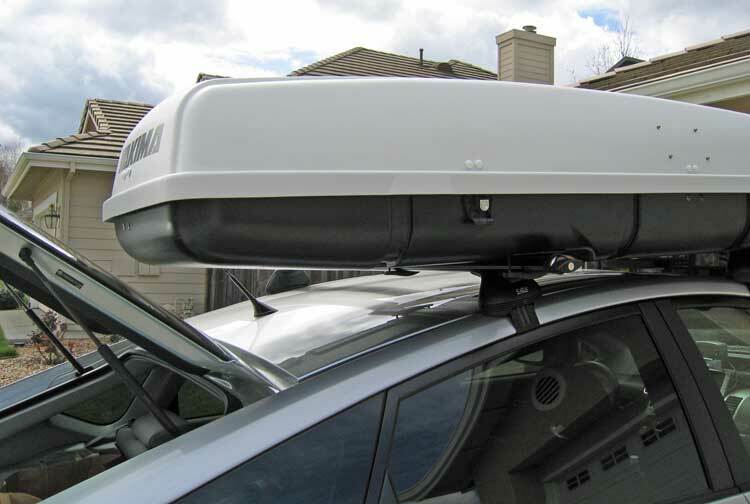 We use the Yakima Rocket box (note that my orignal Rocketbox 16 is no longer sold) several times per year so we can get away with "small" cars the rest of the time. 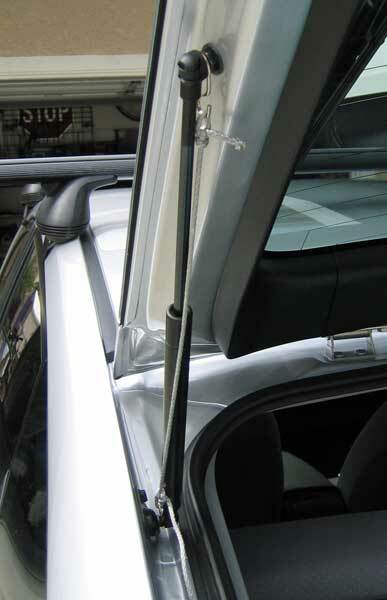 So far I've tried two clip-on cross-bar systems - Yakima and Saris. I've been a big fan of Yakima for many years. 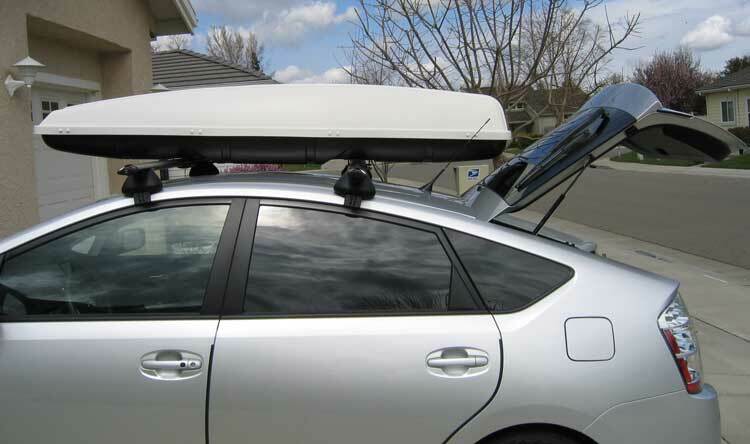 I found that the Saris had a better clip-on cross-bar system, but the Saris system (shown below the Yakima system) is no longer available. For ease of box installation and placement, the factory antenna had to go. I replaced it with a much lower-profile Shark Fin Antenna. 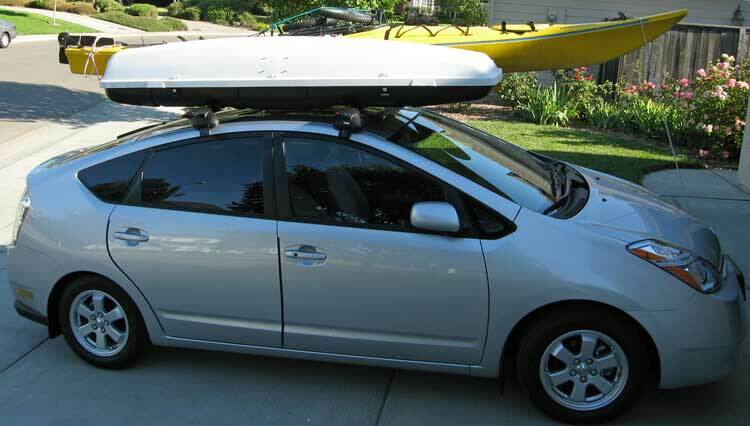 Note: I'm often asked about the mileage hit when I'm carrying gear on the roof or pulling it with the trailer. And my answer is quite blunt: Don't worry about it. I hear this worry all the time, and don't understand it. What are you going to do about it? 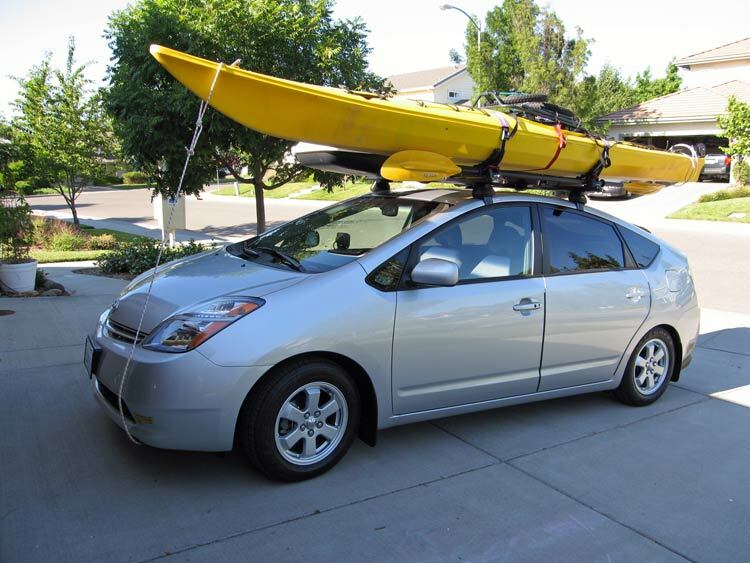 Leave your boats or gear behind because you never want your car to get 35 mpg? 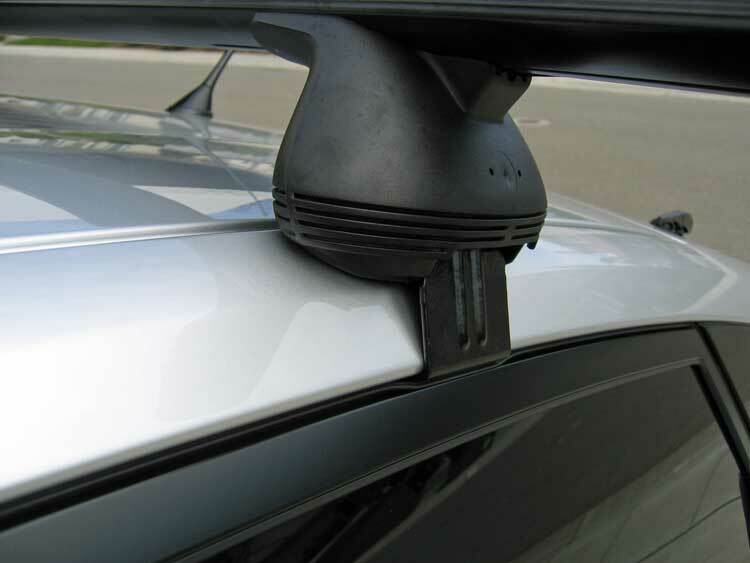 Your mileage will suffer as long as the rack and gear is up there. It is the cost of carrying extra gear. 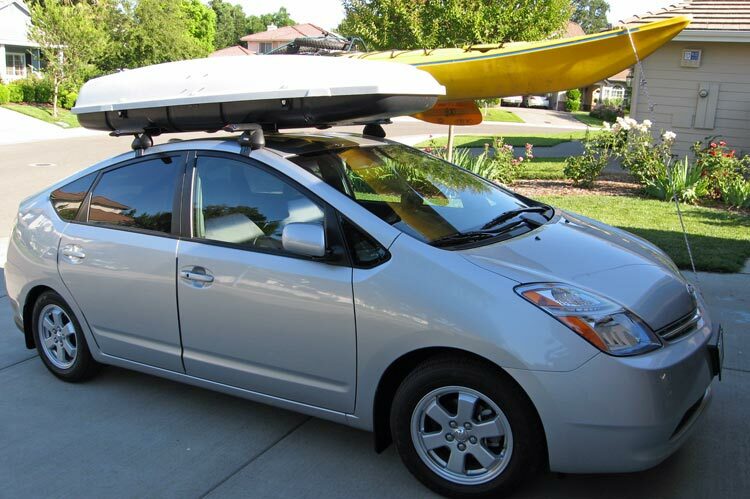 The worst you'll do is better than the best SUV can do when empty - so aren't you happy to have an unloaded Prius the other 50 weeks out of the year? The other times with the rack off the car, you still get great mileage. Just turn off the MFD while hauling gear and be happy. Or stay home and sell your boats and gear. 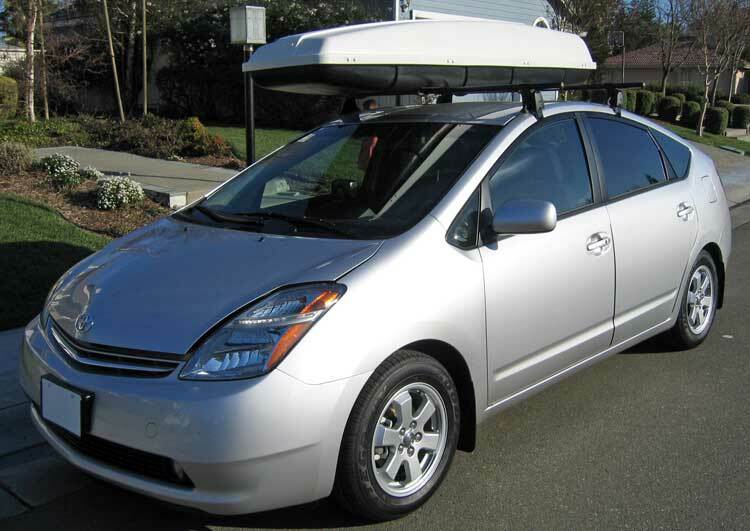 Prius Utility Vehicle Gallery here. 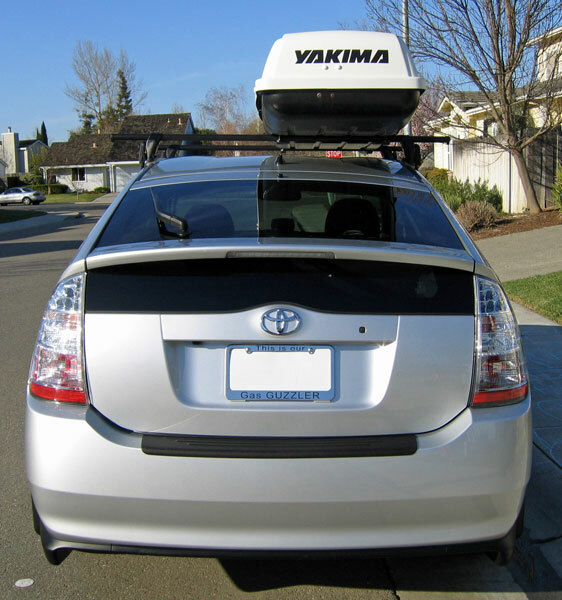 I spread the bars farther apart than Yakima recommends so that the cargo box will fit. As mounted here, the hatch DOES hit the back of the box, but it is still easy to get into the cargo area. I'm just not a big fan of hitting the box each time I open the hatch. 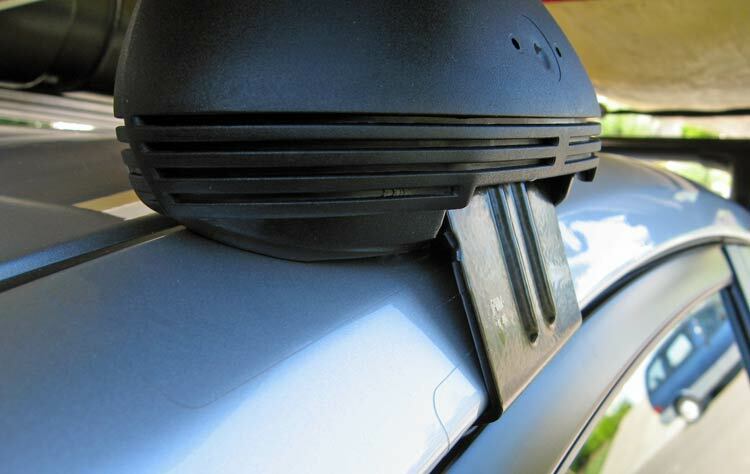 While the Yakima system works just fine once it is on, it can be a PITA to set up, and is almost impossible to put on alone without scratching the car. The other limit concerns bar spread - In order to spread the bars an extra inch or two, you need tools to move the towers and measure... blah, blah. If you want the bars in exactly ONE place, you can spend the time to measure and mount once, and then mark that location. You'll likely be fine from then on - assuming you have an assistant to help attach the bars. 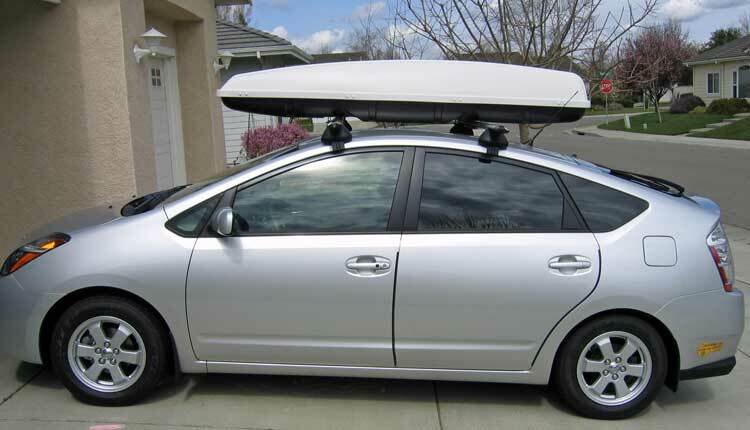 On a recommendation from a helpful PriusChat member, I next bought a set of 59" Saris cross bars with #20 clips (specific for the Prius II). These are slick bars that are much easier to put on, and can be moved fore and aft without a second thought. All adjustment is done without tools from EITHER side of the car. The towers travel toward or away from each other by spinning the endcap - and they travel equal distances, so they are always centered. VERY nice. The clip situation is quite similar to that of Yakima (they are shaped the same, and hold onto the same place). The bars are just easier to mount, and reposition. Another nice feature of the Saris system is that you can slide a carriage bolt into the groove on the top, and mount just about anything you want. No special clips required. The major down-side for me, is that now I don't have one key for all devices. Not a show-stopper, though. Another detail shot showing the clear paint protection that I applied. At this point it was time to cure the hatch collision issue. And of course I decided to go the super-high-tech method of.... rope! I bent some Piano wire into S-hooks and tied (boline!) on some Spectra cord to the correct length. Hooking this contraption around the shock mounts did the trick perfectly. My high-tech device mounts and removes in about two seconds... and stores anywhere. Because of the soft (but way strong!) spectra used, it can stay in place with the hatch closed. No interference with weather stripping or the mechanism. Simple... and it works. I'll just use it when I have the box on top. Here's where the hatch stops now. Another view with the hatch stopped early. All pretty and ready to go with the Saris system. Loaded for a week of fun at Tahoe. On location, Incline Village, NV.